Bike: 16" Surly Karate Monkey - steel frame - with a Reba fork. Karate Monkeys are tanks, simple and plain. And if you're klutzy like I am, you need the kind of burly frame that can survive being chucked off a cliff. The Reba did great as well, although it started losing air pressure toward the end. Wheels: I don't have the bike with me right now, and I don't remember what the rims are. I bought them from a random wheel builder on eBay, for cheap. Those are one of the parts that have ~10,000 miles on them. I've never so much as broken a spoke. Tires: 29" WTB Nanoraptors. Pretty much every Divide racer I've ever heard of uses them, which is basically why I chose them. I used the same set of rubber for 2,700 miles, on top of at least 400 miles in training before the race started. They were pretty much paper by the end. I also ran Slime tubes, which was a great choice. I had a few flats during the last three days, but I was always able to pump them back up after the slime sealed the hole. I never had to replace a tube. Pedals: I bought a pair of Bontrager road platform pedals that came complete with toe cages for $22 after a sales guy at Canyon Bicycles in Draper, Utah, told me I was "probably not going find Power Grips anywhere because nobody, and I mean nobody, runs platform pedals any more." Over the summer, I used Time pedals and two different kinds of clipless shoes extensively. One was a $300 pair of Sidis. My formerly frostbitten toes on my right foot were constantly in agony during any ride longer than three hours. I never had problems with my toes when I was just walking around town, so about five days before I left for the race, I decided the only solution was to wear running shoes. I bought a new pair of Asics that were a size too big. That was one of the best gear decisions I made. If I had experienced the continuous toe pain that I was experiencing during training, I doubt I would have lasted a week on the Divide. Grips: Ergon GE1 Enduro Grips. I had these with no bar-ends, and genuinely experienced little to no hand numbness. The rubber was worn through to metal by the end of the Divide. This is an area where I made an actual smart gear choice (as opposed to a lucky one), because I used to use the Ergon Performance paddle grips, and my fingers often went numb after just a day of long riding. I've also had finger numbness problems with standard grips on my snow bike. Bike bags: The frame bags and seatpost bag were both built by Eric at Epic Designs. The frame bag was great - very close to waterproof, sturdy, and even though I have a small frame triangle, was well-designed to fit a good bulk of my food, my emergency bivy and regular bivy, my batteries, my electronics, drugs, my headlight battery pack and a few other miscellaneous things. The gas tank (on top of the frame) worked as a feed bag to make tasty little tidbits like Sour Patch Kids continuously accessible. The seatpost bag also worked great despite everything it had going against it - it was actually built for my Pugsley, which has more wheel-to-seat clearance than my Karate Monkey. It also was built as an experimental prototype two years ago, and I've since abused it many times in the worst kind of ways, but it keeps holding it together, not to mention holding my sleeping bag and a healthy assortment of clothing. The handlebar bag was a borrowed item. I don't remember the brand. It held my maps and bike repair gear. The tools were a little too heavy for the bag's strange placement on the stem, and it flopped around a lot toward the end. Camping gear: I had a Mountain Hardware Phantom 32-degree down sleeping bag, a Black Diamond Winter bivy sack and a full-length 3/4" Thermarest. The whole set-up weighed in at about three pounds, and was warm and snug down to a few degrees below freezing. It's not waterproof, however, so the prospect of camping in heavy rain was always a concern. That's what I had the emergency bivy for, although I never had to use it. Aerobars: I found riding in aerobars with a big backpack hurt my back and honestly used them probably a total of 30 miles in the entire race. But they did turn out to be a great place to store the SPOT unit and headlight. Backpack: I borrowed a Wingnut Enduro bag because I like the way it distributes most of the weight on my hips, not my shoulders. I put a huge amount of weight in this thing and never had any back problems, unless I tried to ride in my aerobars. I tend to be a water hoarder and was usually carrying at least three liters of liquid on my back. A few times, I filled at least partway a six-liter bladder that I was carrying in addition to my three-liter bladder (my day across the Great Divide Basin was the only time I started the day with a full nine liters of water.) Also in the pack I carried my rain gear, water filter, toiletries, bear spray, bug spray, sunscreen, ACA maps, and sometimes food. A lot of ultraendurance cyclists go to great lengths to keep weight off their backs, but it doesn't bother me all that much. The zippers did implode after a week of dust and rain, and I was keeping the pack closed with safety pins. I considered replacing it in Steamboat Springs, but I couldn't throw it away because it wasn't mine. Clothing: The smartest piece of clothing that I brought was the thing I nearly left at home - a fleece pullover, which I ended up wearing for at least part of almost every day on the Divide. I also got a lot of mileage out of my waterproof rain jacket and pants, not to mention my fleece hat. It was a cold and wet year. One of the big bummers was losing one fleece glove north of Helena. I would have definitely used it more often. I brought two changes of clothing, but I really could have gotten by with one. I ended up washing my clothes every night that I spent in a hotel, and always just wore the same thing if I camped. Arm and leg warmers were nice to have. I brought vapor barrier and wool socks to keep my frostbite toes warm, and was happy I did this. There were a couple of particularly wet hours where, despite all the gear I had with me, my feet were the only warm parts on my body. If I ever did something like this again, I would not skimp on warm clothing. In my opinion, it's more important than camping gear. I think that's the bulk of it. Sorry I don't have many specifics. My gear is all stowed away and I'm mostly going on memory at this point. Any questions? Am I missing anything? 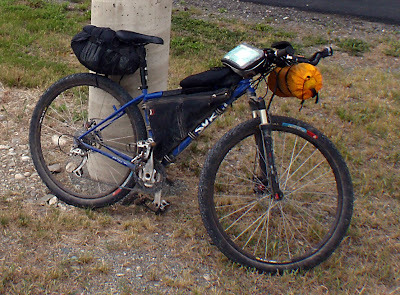 excelent bike packing guide. Good job Jill. And by the way, hello and good to meet you, im Mihai from Romania. Pretty comprehensive guide you got going there, well impressed with your memory. Just one or two question... did you find yourself being chaffed at all by the bags, especially by the frame bag? And getting on and off the bike in a hurry, did the bags get in the way? And lastly... have you got any autographed books left? Good heavens, you make all us roadies look like prima donnas! I think it's ultra-cool that you hang with a budget, don't worry about what it weighs or looks like, and go off & get the adventure nailed. Makes some of us look pretty silly. Reading your blog really makes my day! What GPS unit did you use? With all the talk of mud, did you ever consider taking Pugsley on the ride instead of the Karate Monkey? I'm curious about GPS unit too and wonder why you don't use panniers. Wow, a 16" frame? I've seen the pic of you over at fatcyclist.com and I KNOW you're 9' tall! I ride a 16" frame and I'm only 5'8"
Seriously though, well played making stuff work and packing smartly. As for those slime tubes, check out TrueGoo tubes. They tend to hold up better than slime over the long haul. curious about the sleeping pad. The only 3/4" pad thermarest makes is the ridgerest, a non-self-inflating(ie rubber) pad. but that doesn't pack very small. is it a self inflating pad you use? do you know which one it is? I use SLIME tubes extensively all over western Nebraska & have had excellent luck with them & consider our area to be the goat-head capital. Did you use any Smartwool clothes? That stuff is the bomb for any time of year but especially in winter, my wife & I have various baselayers & jerseys from them & love it, can be pricey though so we're always looking for the specials. GREAT list of stuff & what worked for you, I'm a low budget guy also & consider my Karate Monkey to be bombproof! Thanks so much for doing this. Much appreciated. Shelldon ... I don't have any books left. You can still order through amazon. I'm not sure when and if I'll take up distribution again. Self publishing was a fun experiment but more work than I bargained for. KM ... My GPS is a Garmin Vista HCX with topo maps. It went on the fritz for a bit, but I got it to work again. I rarely leave home without it. JP ... I sometimes wished I had Pugsley, although I'm not sure fat tires would have helped in most Divide mud, where stickiness was much more of a problem than float. It was like riding in peanut butter. JayP ... with you on the slime tubes. They were awesome. Mbjorn ... I still own a full set of panniers that I may never use again. Once you make the switch to rackless, you'll never want to go back. I even use my bike bags for road tours these days. b ... I'm pretty sure it's a Prolite. Self-inflating. I thought they were 3/4" thick. I could be wrong. Maybe I'm thinking 3/4 length. But mine is definitely full length. Let me know if you need GPS stuff in the near future. I somehow have acquired more Garmin things than I can deal with. You mention headlight on the aerobars, what headlight did you use? Did you have backup light like a headlamp? gosh jillster...why don't you give credit to the wheel builder??? 10k miles and not so much as a broke spoke??? you need to thank them!!! Oh and do you only respond to those who buy your books and/or donate to you? Paxton ... it was some kind of Specialized LED headlight, with a battery pack that held 8 AA batteries. I'm terrible about the specifics of my gear. I buy it and throw away the packaging and forget all the details. In the case of that light, I just borrowed it. Regarding the wheels, I honestly don't remember who I bought them from. Guy on eBay. I guess it's pretty obvious I'm not much of a gearhead. Wish I was, to be honest. I recognize I'd get better results if I put more thought into it, but at the same time, I like the freedom of not thinking about it. That pretty much everything I've tried has worked out well for me is either a testiment to my flexibility or my luck, you decide. So, just curious: What was the maximum amount of water you used in a day? Did you ever really need all 9 Liters? very cool blog. good for you for being out there. i'm right behind you!